This July, shoppers are in for everyday healthy treats as Robinsons Supermarket celebrates the month-long Freshtival, offering exciting discounts, freebies, special offers, and rewards on fresh items in all outlets nationwide. A cooking demonstration showed the audience how to make kid-friendly dishes with a healthy twist. From July 1 to 31, moms and the kids can avail of a P5 discount when they buy the Lemon Square 10-piece assorted cupcakes pack that’s perfect for school baon. Those who love hamburgers can buy the 452-gram pack of CDO Highlands Beef Patties to get 2 free pieces of Danes Cheese Slice. Want a cool, free dessert? Buy any 1.5-liter Selecta Ice Cream and get a 750 ml Selecta Ice Cream. 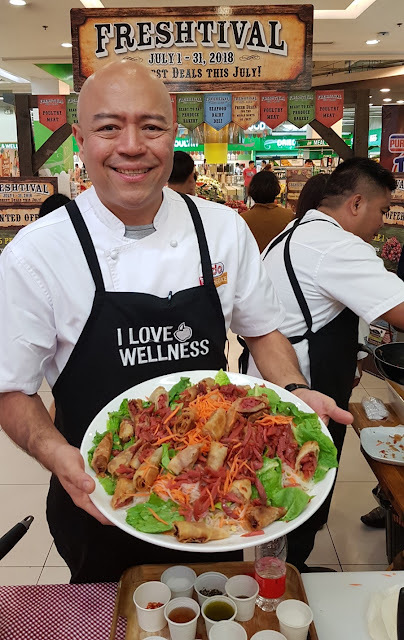 Together with its own Wellness Festival to celebrate National Nutrition Month, the Freshtival is Robinsons Supermarket’s way of helping promote healthy eating among their shoppers as it encourages them to use only the freshest and quality ingredients—seafood, dairy, deli, produce, meat and poultry—in cooking-up delightful yet nutritious meals for the family. Robinsons Supermarket ensures the freshness and safety of meat products by keeping them in refrigerated display racks. “The Freshtival is really a fun and exciting way of offering fresh products especially to moms and kids,” said Elsie Cabuguas, Robinsons Supermarket division merchandising manager during the launch of the 5th Freshtival at Robinsons Magnolia in Quezon City. Customers enjoy the same quality of seafood products comparable to those found in wet markets. Aside from providing the freshest quality products that are competitively-priced and comparable to those found in wet markets, Robinsons Supermarket offers the convenience of having all items under one roof, inside the mall. “This makes grocery shopping an ideal bonding activity for the family especially on weekends since they can go around and have lunch or dinner,” Cabuguas noted.